The English Language Institute (ELI) hosted its second biannual student Posterfest on Thursday, Dec. 11, at University College. One hundred-seventeen ELI students presented 59 posters (digital and paper displays). Topics were wide ranging and included biomedical, chemical and civil engineering; education, renewable energy and social and cultural issues. 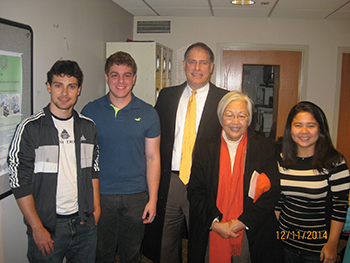 Pictured, from left, are Henrique Ribeiro Flores, Luiz Henrique Marra da Silva Ribeiro, Provost Eric Spina, Dr. Ruth Chen and Flavia Mistue Yamashita. The majority of students are from Brazil, China and Saudi Arabia, with smaller representations from other countries such as Iraq, Japan, Macau, S. Korea and Taiwan. Students of varying proficiency levels explained their study project and poster topic to guests from across the SU campus, among them Provost Eric Spina and Dr. Ruth Chen. The ELI provides intensive English instruction to international students and visiting professionals at all proficiency levels. Visit http://www.eli.syr.edu or call 315-443-2390 for more information.